"A tasty and healthy toasting bread for cold winter mornings." Place ingredients in the bread machine pan in the order suggested by the manufacturer. Select the multigrain setting, and press start. Didn't rise enough, I was skeptical about the small amount of yeast called for and should have added a little more. 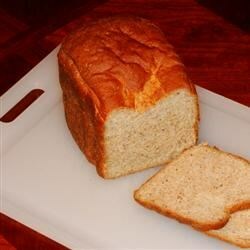 My family really liked this bread - a more interesting flavor than plain whole wheat. I found the dough to be too sticky, so I added some extra flour - about 1/4 c.
Not only is this recipe easy, but it baked up perfectly in my bread machine. Great flavor and color - and very moist! This is a great recipe! I too had to add about 1/4 C flour, and kneaded for about 5 minutes before letting it rise again. Good healthy bread. This was the first time I have ever made bread and it came out perfect!! I love the flavor and it was so easy! !